Dr John Briffa is a renowned specialist in nutrition and weight loss. A practising doctor, consummate journalist, broadcaster and author, Dr Briffa lives and works in the UK where he was born to Maltese parents. To anyone reading leading UK newspapers, Dr John Briffa needs little introduction. He’s a former columnist for the Daily Mail and the Observer, and former contributing editor for Men’s Health magazine. He has authored for dozens of newspaper and magazine titles internationally, and is a previous recipient of the Health Journalist of the Year award in the UK. His latest book ‘Escape the Diet Trap – lose weight for good without calorie counting, extensive exercise or hunger’ will be published in January in the UK. Dr Briffa is proud of his heritage and has chosen Malta as the first place in the world to reveal the ground-breaking concepts contained in the book. We’ve an exclusive Dr Briffa article here, based on insights from the book. 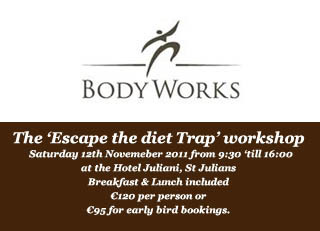 In partnership with Bryn Kennard of Body Works in Spinola Bay, he will be revealing the secret to lasting weight loss in the ‘Escape the Diet Trap’ workshop, 12 November, at the Hotel Juliani, St Julians. (Details & Booking info below.) See the Dr Briffa Bodyworks Workshop Programme (pdf download). Time and time again the conventional approach to weight loss, ‘eat less, exercise more’, has been shown to be a dismal failure for those looking for long-term sustainable weight loss. It is normally put down to lack of will power or discipline when many fail to control their weight following endless cycles of eating less and exercising more. However, there is good reason to believe that it is not so much that diets don’t work, it’s that they can’t work. Dr John’s premise is that eating less and exercising more goes against the fundamental design of the body. If calorie intake is cut, it can stall the metabolism as the body seeks to conserve energy. Not only that, when a cycle of eating less ends and normal eating patterns are resumed it can take three months or more for the metabolism to boot up to normal levels. Studies have also shown that people who tend to eat less also tend to move less making the exercise part of the equation a much harder to sustain. The role of exercise in weight loss has been wildly overstated. In fact, studies clearly show that exercise is quite ineffective when it comes to weight loss. This is not to say that exercise is not important, on the contrary, it still plays a massive role in both aesthetics and health, it just means that it needs to work more intelligently as part of our overall wellness routines. We asked Dr Briffa to explain a bit more about what’s going on here. Q. 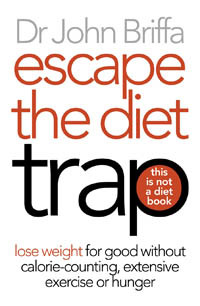 The logic behind ‘Escape the Diet Trap’ seems so sound and such common sense why has it eluded us for so long? Dr Briffa: Some of the misinformation regarding weight loss has come because the calorie principle – the idea that weight loss is an inevitable consequence of ‘eating less and exercising more’ is so persuasive. It makes so much sense. And when it doesn’t work (as is almost always the case in the long term), the tendency is to blame would-be slimmers rather than take another look at the theory and see if it stands up. Q. Why Malta as the place to give a first public airing to the theories in ‘Escape the Diet Trap’? Your Maltese roots aside, did Malta’s obesity statistics play a part in the decision? Dr Briffa: Yes, to some degree the fact that Malta has an obesity issue was a motivating factor for me. Plus, as you say, my Maltese roots of which I’m very proud was a big draw. Yet, another factor, I think, was how deeply set the misinformation appears to be in Malta. As I’ll explain in the seminar, the fat phobia that abounds is likely to be actually driving the obesity epidemic. It breaks my heart to see so many people put effort into approaches that are essentially dooming them to failure. Malta is not alone in this, but my connection with the island and rates of obesity here all add to my desire to do something positive about the situation. Q. What Eureka moment led you to take a holistic approach to wellness and health as your key area of interest in the health sector? Dr Briffa: Soon after leaving medical school, I was working as a junior doctor and struggling with a few health issues of my own. I’d grown flabby during my six years at medical school and would often get crashing fatigue in the mid-late afternoon. One morning, I found myself assessing an elderly man who had come in for a hernia operation, and I was struck by how well and vital he was. I asked him the secret of his success. He put a lot of it down to his diet. My early experiences and medical education meant that I’d never actually considered that diet might be important to wellbeing and health. The chance conversation that morning sufficiently piqued my interest for me to invest in a nutrition book that very day. I read it in a couple of sittings, and I think a light bulb came on. I set about changing my dire diet. While I didn’t realise it at the time, what I ended up eating was a lower-carbohydrate, ‘primal’ diet. Within a couple of weeks I stopped having difficulty staying awake in the afternoon. And in six weeks, I lost all the excess baggage I’d accumulated over the preceding six years. Yet, I was not hungry and had not taken any additional exercise. This experience led to me thinking radically differently about what it takes to lose weight successfully, as well as the influence of diet on general well-being. Thank you Bryn for introducing us all to Dr Briffa – one thing I can say from my personal experience is that his principles DO work! Well done Bryn for your constant search for holistic approaches to a healthier body because I agree that we need to reconsider ‘counting calories’. People generally seek ‘quick fixes’ because our lives are so stressed and full that there is almost no time allocated to be able to return to simple fresh food, cooked and eaten with a relaxed and happy approach, round the family table. Wishing you and Dr Briffa every success! Thank you for your comments. I have worked in the health and fitness industry for over 10 years and, during that time, I have never implemented a weight loss program because I never believed the calorie principle to be effective for long term weight loss. However, sInce running my own studio I have become increasingly aware of the need to offer a weight management program in order to be competitive. In my research I came across Dr Briffa and was struck by his scientific approach to weight loss. This led me to write to Dr Briffa to see if he wished to collaborate in some way on the subject of weight loss and this introductory seminar was the idea that we came up with. The fact that Dr Briffa was Maltese gave me the inspiration to contact him. Luckily enough, he is very proud of his roots and has been nothing but excited and enthusiastic about coming to Malta and sharing his work. I wrote to Dr Briffa because I felt that if the calorie principle was going to challenged here in Malta then it needed a higher authority than myself and that this should come in the form hard science and not merely conjecture, as is so often the case. Because Dr Briffa is Maltese, and his opinions are evidence based, made him the perfect candidate, as who else would you want to hear about the growing global discontent to the calorie principle than one of your own. Coincidentally Dr Briffa was writing a book, something that I was not aware of until the topic of a title for the seminar came up. In order to make the seminar more attractive and enticing we decided to tie this in with his new book. I would like to point out that this seminar is not organised by Dr Briffa’s publisher nor is it part of a wider PR campaign for his forthcoming book, but an independent act by Dr Briffa himself and myself. While I appreciate that buying his book may work for some, sadly, a book is not enough for everyone. Weight is a hugely sensitive issue and many people have and continue to spend far more than the quoted €95-E120 on solutions to their weight problem., for instance a nutritional consultation is around the region of €30-40 and this is for one hour. What we are offering is a full day of interaction with a world respected authority on the subject of weight loss. Not only that, we have someone who brings fresh ideas and inspiring hope to many whose weight is a constant struggle and have believed that the problems lies with in them and not the approach. The seminar will give people the opportunity to ask all of those burning questions to the author in person. Having regard to all this, I am confident at those who attend will be satisfied that the event was value for money. Well done and we wish you good luck for the event, am sure you will have lots of support.